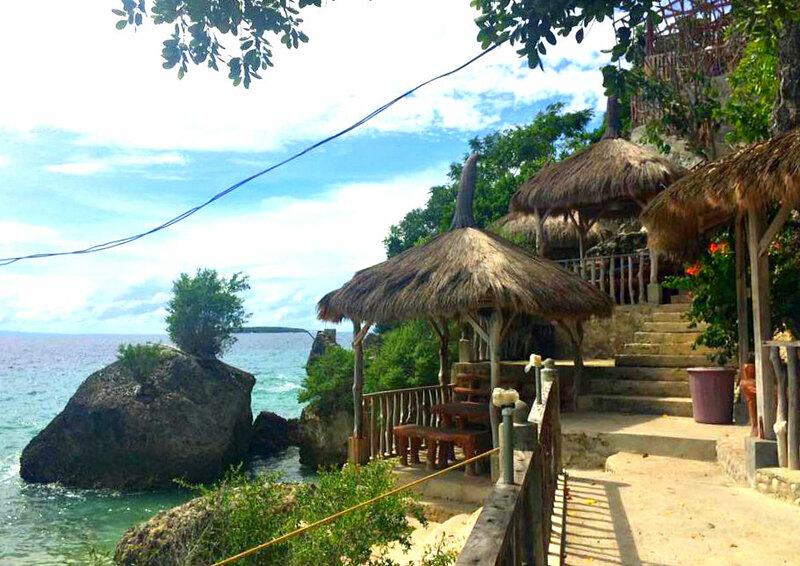 Cangcuaay Private Beach is a relaxation facility nicely established and tucked by the seaside in Tanawan, Oslob Municipality. 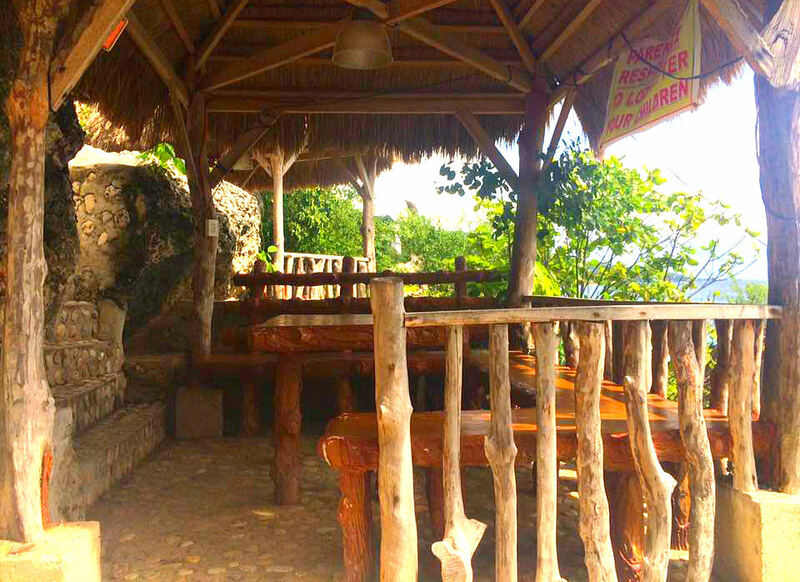 It is located close to the main road in South Cebu, which is famous for its pristine and emerald sea water and white beach areas. Cangcuaay Beach is a resort with facilities that cater to your holiday or weekend breaks. This private resort offers beach cottages, overnight stay facilities including rooms for rent, tents, swimming facilities, and any exciting water activity they can provide. TRIVIA: This resort is famous for its rock formations or huge boulders and rock walls which projects unique views especially in pictures. Probably, it is the only resort with such exciting rock formations in the area. As you get off from your vehicle (bus, van, private vehicle), you will immediately observe the inviting emerald or blue open sea and islands in the distance. 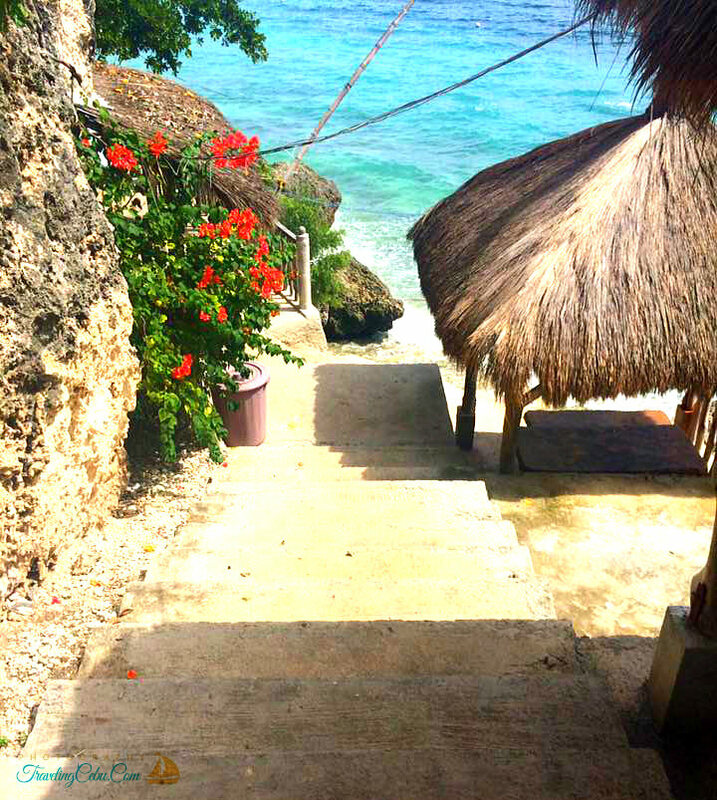 You will be more amused when you see the steps that lead you down towards the resort itself. Lots of steps! Both the left and right-hand sides of the steps (or stairway) are adorned with decors and tropical flowering plants. One step at a time while building up your excitement on your way down. Yes, these rock formations are one of the main attractions and unique features of Cangcuaay Beach Resort. You will find cottages on top of them. You can jump from on top of it down into the refreshing sea. In fact, there is a diving board on one of these boulders. By the rock walls, in between the rocks, by the side of the rocks, you can find hammocks where you can lay on and doze off or read a book. 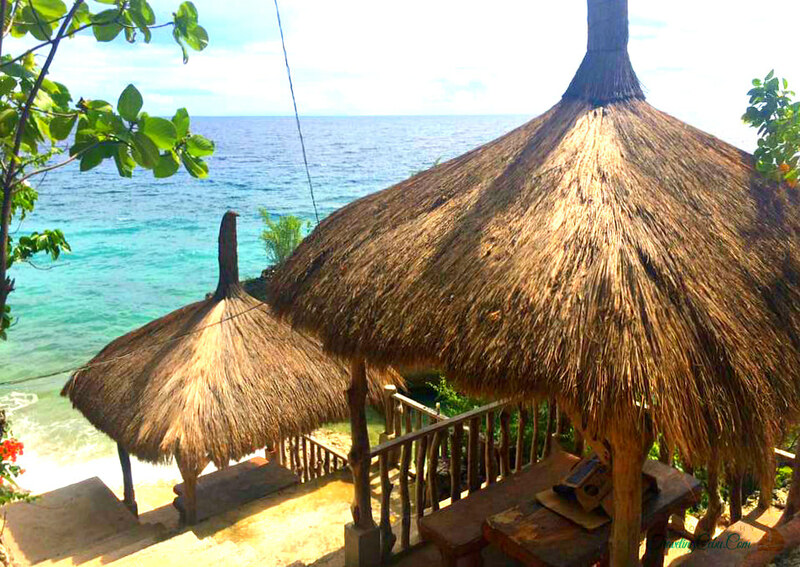 These cottages have Cogon Grass roofing but have no walls. Yes, they have no walls. They have tables and chairs set per cottage. They look pretty with their extended tops with a round-shaped that looks like a Hershey’s chocolate (only its color is brownish or gray and not silver!). 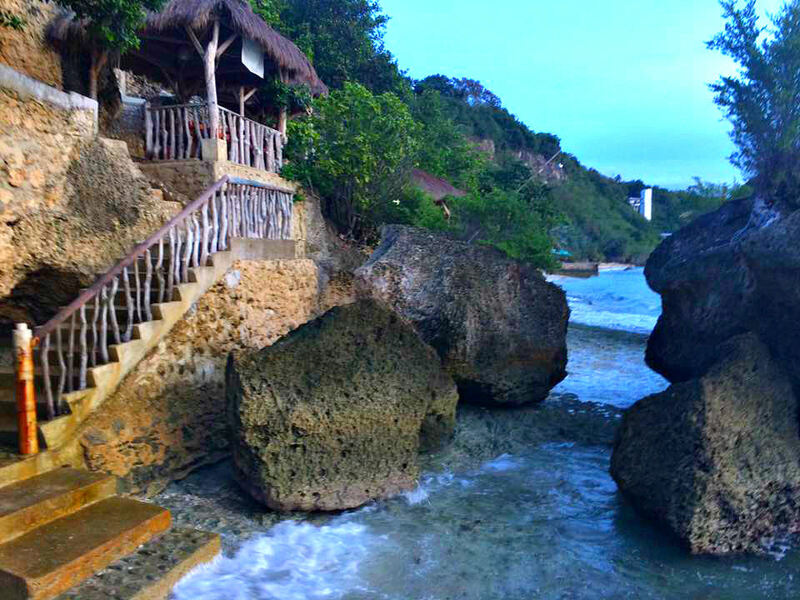 These tropical and environmental cottages are built on the rocks where you have a magnificent panoramic view of the sea. FREE! Yes, the cottages are free of charge - if you get one first! So, better be early. Priority of free cottage use also is given to bigger groups. Just clean them up before you leave! Yes, bring food and drinks as much as you can inside the facility. As mentioned, you are only asked to clean up after enjoying the free space. If you need something to support your immediate needs, Cangcuaay has a Sari-Sari Store (miscellaneous products store) inside its property. Tent B: 600 Pesos per guest. This is good for 2 guests and includes bedding, pillows, and blankets. TENT: 1,200 Pesos for a maximum of 4 guests. It includes a sofa, blankets, and pillows. TENT: 3,500 Pesos for a maximum of 16 guests. This offer also includes island travel to Sumilon Island aside from the inclusions above. Floaters/Body Board: from 200 to 400 Pesos each. They are available for sale. Standard Room: 2,500 Pesos for overnight. This is good for two guests and includes breakfast. Deluxe Room: 4,500 Pesos per night; good for two guests and includes breakfast. Master’s Bedroom: 6,500 Pesos per night. This room is good for two guests and also includes breakfast for two. Please, make sure that you reserve your room in advance before you go when planning to stay overnight with a room such as any of the above. Go to Cebu South Bus Terminal (at N. Bacalso National Road). Take a Ceres or Sunrays with a signboard “Bato via Oslob.” Make sure you have that direction. The fare, depending on the bus, is about 180 Pesos for a 3-hour trip. Tell in advance the driver or conductor to drop you off at Cangcuaay which is located just beside Seafari Beach Resort. From Samboan, take a Sunray Bus that will take you directly to Oslob and simply tell the conductor in advance your final destination. From Moalboal or Badian Municipality, you can take a buy (Ceres or any) going to Bato. Then get off in Bato and transfer to another bus for Oslob. From Dumaguete City, you need to go to Sibulan Port to take a ferry bound for Lilo-an Port in Santander. 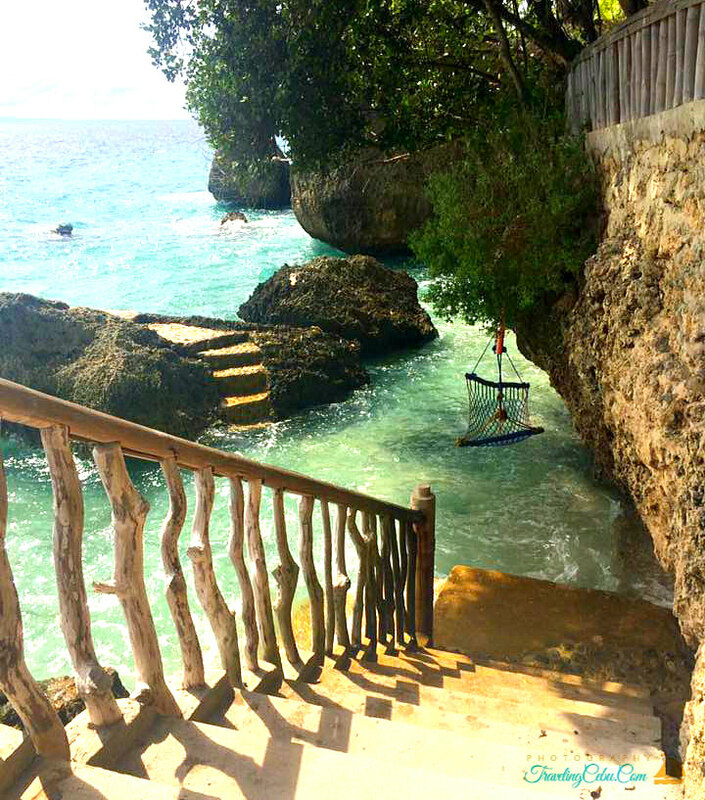 Then take a bus bound to Oslob and tell the conductor to drop you at Cangcuaay Private Beach resort. Please, let me know should there be any issues with the details above. Would be happy to hear your feedback. Thanks a lot for your visit to this site. Have a fantastic trip and beach holiday.